Click this link to view a brief description of how we can help you with your smile. Click this link to view a brief description of how we can help you address teeth with cavities using new filling technologies. Click this link to view a brief description of how we can help you maintain your appearance and dental / oral health with bridges. Click this link to view a brief description of how we can help you maintain your appearance and dental / oral health with crowns. Click this link to view a brief description of how we can help you maintain your appearance and dental / oral health with dental implants using modern technologies. Click this link to view a brief description of how we can help you maintain your dental / oral health with extractions. Click this link to view a brief description of how we can help you maintain your dental / oral health with root canals. Click this link to view a brief description of how we can help you maintain your dental / oral health by addressing periodontal disease. DENTISTS PAYMENTS. The office philosophy is high quality and dependable work for a reasonable cost. A cavity shouldn’t put a hole in your pocket. The office participates with many insurances. For a full list of insurance companies click here. Finance plans are available through Care Credit. We use digital X-rays which expose patients to less radiation than traditional film X-rays. We use the most modern sterilization equipment including autoclave. We have a technician on premises for emergency replacement of teeth, temporary bridges and denture repairs. DENTIST PROCEDURES. 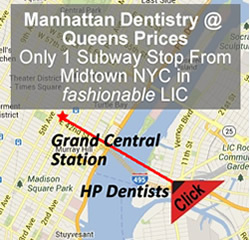 We perform the following dental procedures in our Long Island City office which is located in Queens only one subway stop from Midtown NYC. 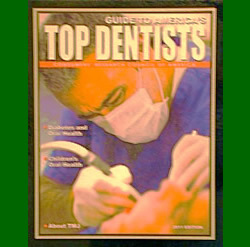 Click to our Dental Procedures section for a complete listing and details. Nitrous Oxide Analgesia (laughing gas) . All phases of general dentistry including fillings, extractions, root canals, crowns (caps), bridges, cleaning and periodontal treatment. Full dentures and cosmetic partial dentures (no metal wires).